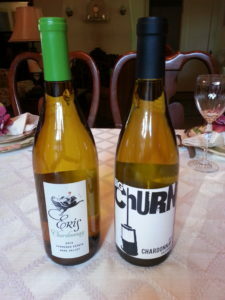 Big Churn – 2014 California Chardonnay sells for $6.99. This is a big wine that opens up with oak in the nose and hints of vanilla. Malolactic fermentation is in full swing here and is, perhaps, a bit overdone. Appearance is honey yellow and the wine is 14.5% in alcohol. The wine does display fruit notes of pear with a smooth, lingering finish, but the wine is just too overpowering for my taste. This wine is vinted and bottled by Big Churn in Napa. Eris Chardonnay – 2014 Carneros Estate Napa Valley, is bright yellow in color, made from 100% chardonnay grapes from a single estate on the Napa side of Carneros. This is a much more refined chardonnay than the Big Churn and at $12.99 a bottle, a pretty decently priced wine. The nose is faint but the wine is buttery and smooth, with a creamy mouthfeel. The flavors are fruity with hints of peaches and citrus and finishes with toasty vanilla. This is definitely a better wine than the Churn and worth the extra $6.00 per bottle. I can’t swear to it, but the Eris Chardonnay may be related to Cuvaison. My searches online for Eris Chardonnay kept leading me to the Cuvaison website. Again, not sure, but snap up some bottles of this delicious chardonnay before they’re gone.